Copy the API token from your QDS accounts. To get the API token, on the QDS UI, navigate to the Control Panel > My Accounts. In the My Accounts tab, copy the API token that is against the QDS account that would be used on Looker for running commands. To copy the API token, click Show and the token is displayed. Copy it and keep it handy on a notepad or word file. For more information on the My Accounts tab, see Managing Your Accounts. Presto cluster with 0.157 or higher version is required for the integration. 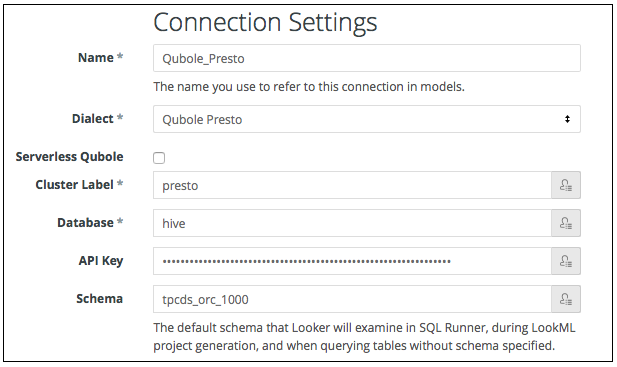 Update the version in the Presto cluster configuration before configuring the Looker. Once the Looker instance or server is ready, log in to your Looker server which was set up as part of Understanding the Prerequisites for the Integration. Click the Admin link on the upper right corner and the General Settings page is displayed. From the navigation pane on the left, click Connections under the Database section. The Connections page is displayed. On the Connections page, click the New Connection button on the top-left of the page. The Connection Settings page displayed as shown below. Enter a name for the connection in the Name field. Select the appropriate Qubole Presto cluster version from the Dialect dropdown list. For example, Qubole Presto. Select the Serverless Qubole option if you want to send the queries to the Presto clusters run by Qubole. The Serverless Qubole option is not enabled for all users by default. Create a ticket with Qubole Support to enable this feature on the QDS account. Enter the Qubole cluster label name in the Cluster Label field. Enter hive in the Database field. Enter the API token in the API key field. Enter the database or schema name from Qubole in the Schema field. For example, tpcds_orc_1000. The database or schema is necessary and sufficient information to get started with Qubole in case the Qubole account is on the api.qubole.com Qubole environment. In JDBC and ODBC driver configurations, https://api.qubole.com is the default endpoint. To save tables that Looker fetches from Qubole, configure the below settings. Select the Persistent Derived Tables checkbox in Looker and fill in the Temp Database. Click Test These Settings to verify the connection. A Testing… message is displayed while Looker tries to run a query on Qubole to verify the connection. If the connection is successful, a message similar to the below message is displayed. One common error related to the connection is displayed as follows. User account is not on https://api.qubole.com and you have not added endpoint=<Qubole_URL> in the Additional Params field. To fix this error, verify if the API token is correct or the Qubole environment is added in the Additional Params field. For more information, see step 4 of Configuring Looker.